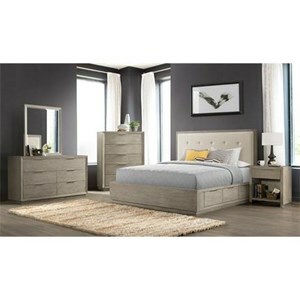 The Sun Valley California King Bedroom Group by AAmerica at Reeds Furniture in the Los Angeles, Thousand Oaks, Simi Valley, Agoura Hills, Woodland Hills, California area. Product availability may vary. Contact us for the most current availability on this product. Drawer Suspension Full extension ball bearing glides are used on all drawers for smooth action and ability to easily reach your items in the back of the drawer. Drawer/Shelf Construction English dovetailed drawer construction both front and back that gives you unlimited pulls and still remains tight. Finished interior drawers so smooth they protect your most delicate items. Felt-lined top drawers. Finish & Paint Options This collection has a nine step process finishing. This charming furniture collection is not only on-trend with its design style but also innovative with its storage solutions. 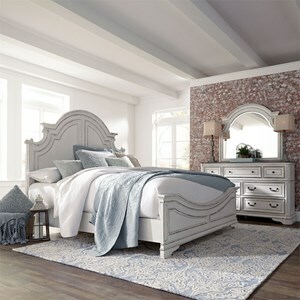 The centerpiece of the collection is the rotating storage bed which uses a circular rotation table hidden beneath the mattress to provide six storage compartments (in addition to the single compartment located on either side of the footboard). Rustic themed drawer pulls and barn style doors complete the look with a early-country charm. The Sun Valley collection is a great option if you are looking for Rustic Industrial Cottage furniture in the Los Angeles, Thousand Oaks, Simi Valley, Agoura Hills, Woodland Hills, California area. 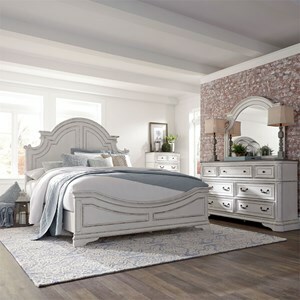 Browse other items in the Sun Valley collection from Reeds Furniture in the Los Angeles, Thousand Oaks, Simi Valley, Agoura Hills, Woodland Hills, California area.